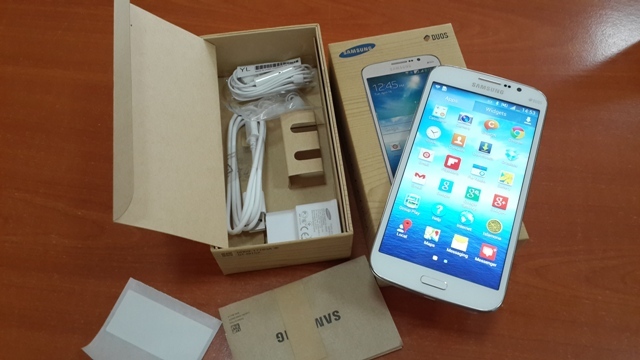 Samsung recently launched the Galaxy Mega 5.8 in Kenya, that was unveiled globally sometime in April. They positioned it for the user who wishes to have more than a smartphone in their hand, but a large screen with which to do more productivity and media consumption. The Galaxy Mega which will be retailing at between Kshs. 35,000 and Kshs 38,000 is already available in the shops. The I9150 is the single SIM version while the I9152 is the Dual SIM version, I have with me the dual-SIM one. The specs are as below. The Galaxy Mega is not a phone you can use with one hand to reach all of the screen, but for typing and several applications, you are able to set single handed use in the keyboard and select the side you want to type using, like the left or right. This was a feature introduced in the Galaxy Note. The box, just like the predecessors before it the Galaxy S 4 and others is made out of recycled paper and soy based ink printing for the green agenda. Inside the box you find the usual accessories, the battery, USB cable, earphones and extra ear-buds. The notifications area is also like the one on the Galaxy S 4 minus several gesture based features. This one has less sensors, so you wont expect air view, smart scroll, air gesture and smart scroll, but it has smart stay which uses the front camera. Something else, the toggle to switch on WiFi hotspot is up there in the notifications area, something I find quite handy. The device is available in three colours, White Frost, Mist Black and Plum Purple. The white and black ones are the colours you will find in the shops, chances are that the Plum Purple isn’t available in your markets. The design of the phone is something between the Galaxy Grand and the Galaxy S 4, including the silvery band at the sides. Everything is set like the others, charger port at the bottom, next to the mouth piece, volume rocker on the left, power button on the right, sound jack port at the top and the camera at the top of the back with the speaker on one side, the LED flash on the other. Homepage has an interesting twist. This is the first Samsung smartphone among many to have a rotating home-screen. Previously you needed a third party launcher to achieve that, but since this is something between a tablet and smartphone, I think Samsung saw that necessary. Why don’t we meet again in a few days when I will have played enough with the device to give a full review. As for now, let me charge the phone and set up my account and other things I missed before penning this up.